NEWINGTON - Dreams of sunny beaches and tropical drinks or a Christmas market and light festival? Consider thinking beyond the typical getaway as the northeastern U.S. falls under the dead of winter. 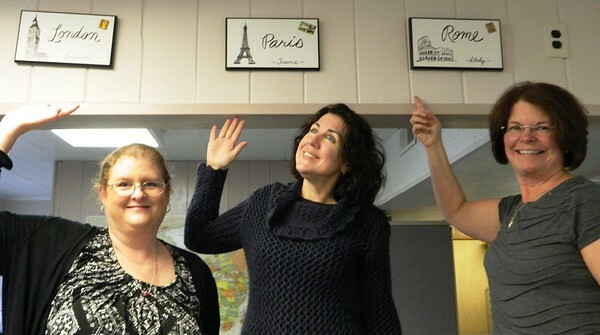 French’s Travel owner Valeri French and fellow agents Sandra Godbolt and Karen Powell encourage people to look at all their vacation options, since tropical destinations are often swarming with tourists in winter. Between December and March airline and hotel costs drop dramatically in Europe, a unique alternative to a trip to Disney or the Caribbean. Sightsee in Rome or London, or adventure off the beaten path to lesser-known destinations with seasonal events. The Amsterdam Light Festival begins Nov. 29 and continues all the way through January 2019. Hundreds of artists, architects and designers create spectacular light installations during this open-air competition. A popular way to view it is by taking a boat cruise through the city’s famous canals. The Venice Carnevale, a celebration of Venetian artisans with masked costume balls and parades, runs from Feb. 16 to March 5. The Menton Lemon Festival is one of the longest-running traditions in the French Riviera, set to draw hundreds of thousands of visitors Feb. 16-March 3. This is a celebration of citrus, with building-size fruit sculptures and chef-inspired food. Menton is the last coastal town before the Italian border, with the warmest winter in the south of France and over 300 days of sunshine per year. Early fall is the busiest and most costly time to head to Germany, because Oktoberfest draws huge crowds. When the party ends, travelers will enjoy more options, better prices and fewer hassles. For couples and families who don’t mind a few snowflakes, French recommends Germany and Eastern Europe around the holiday season. “Every little town has a Christmas market,” she says. Here you’ll come across magical traditions, music and hand-crafted goods to take home and share with loved ones. Athletes from all over the globe will flock to Gstaad, Switzerland Jan. 24-29 for the annual Snow Bike Festival in the heart of the Swiss Alps. Music lovers congregate in Denmark in February. The Vinterjazz Festival takes place Feb. 2-25 with over 500 concerts all over the country, from small towns to cool capital Copenhagen. Or hop on a direct flight at Bradley Airport to Dublin, Ireland, for the most unforgettable St. Patrick’s Day Festival, set for March 14-18. French’s Travel agents can help you secure the best deals on flights, hotels, transportation and exciting excursions. “During these cold winter months we all definitely need a break and to get away,” French says. French’s Travel is located at 50 Market Square in Newington. (860) 666-4625. Posted in Newington Town Crier, Business, Newington News on Wednesday, 21 November 2018 18:48. Updated: Wednesday, 21 November 2018 18:51.